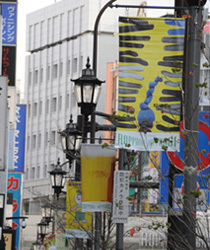 Each light post in Roppongi will be decorated with one completely original flag. We are pleased to hold "Roppongi Designers Flag Contest 2010" with the aims of supporting young designers and celebrating the important role that Roppongi plays in the art and design fields. The theme this time is "green." The competition was held, once again with the support of the Japan Graphic Designers Association, in January. The works will be on display in the town for one month from Thursday, March 25 till Sunday, April 25. It will also be possible for passersby to vote on their favorite flags from their mobile phones by using tags wrapped around the trees that line the street. Born 1939 in Osaka. NAGATOMO graduated from the Kuwasawa Design School in 1961 and joined the Nippon Design Center Inc. that same year. In 1969, he co-founded K2 with KURODA Seitaro. NAGATOMO's works to date include art direction for editorial design, advertising, corporate identity and space design. He also illustrates prose works and serialized magazine essays. His publications include Soro Soro Ii kana (I think that will do it), Tomokaku Shizuka ni (Just be quiet), Gurasu no Soko ni (At the bottom of the glass), Beppin no Tai (The most beautiful sea bream), Inu Kara Hitokoto (One thing that a dog has to say), and Seiko Suru Meishi Dezain (Successful business card design). Born Sapporo, Hokkaido in 1949. KASAI works for SUN-AD CO., LTD. Major achievements include doing the art direction for Suntory Oolong-Tea and UNITED ARROWS advertisements for many years. He recently renewed the corporate identity for Suntory Ltd., the Suntory Museum of Art, the Roppongi Shopping Street Association, the Tokyo Midtown and Gotemba branches of Toraya, and director Hirokazu KOREEDA's film “Still Walking.” Awards he has received include Tokyo ADC Grand Prize, Mainichi Design Award and Kodansha Publication Culture Award. Born 1954 in Aichi. HIROMURA entered Ikko Tanaka Design Studio in 1977. He established Hiromura Design Office in 1988. His major works include the corporate identity and signage of the National Museum of Emerging Science and Innovation, the visual identity and signage for CODA Shinonome, advertisement planning for Marunouchi Building, signage at the Nissan Motor Design Center, the symbol design of the 1300th Anniversary of Nara Heijo-kyo Capital and the visual identity of Yokosuka Museum of Art. HIROMURA held a solo exhibition, “2D⇔3D,” at Ginza Graphic Gallery in 2007. He received the Mainichi Design Award in 2008. He works as an art direction advisor for Tokushu Paper Mfg. Co., Ltd. and Kinokuniya Co., Ltd.
Meet the many faces of Roppongi! With every day and every step, Roppongi reveals a new aspect of its character. Now it is attracting attention as a center of art and culture. It was with the aim of recording the changing face of Roppongi that we held the "Second Roppongi Photo Contest." All kinds of photographs could be entered – from images of the town's nature and culture to reportage of festivals and events or snapshots of people. At the end of February, photographer TATSUKI Yoshihiro again kindly judged the contest. The winning photographs will be shown from Thursday, March 25 at FUJIFILM SQUARE within Tokyo Midtown. Come and enjoy the beauty of Roppongi as caught through the camera's lens. Born 1937 in Tokushima. TATSUKI graduated from Tokyo Polytechnic University, the former Tokyo Professional School of Photographic Industry. He joined AD Center as a photographer when it was established. In 1969 he started working freelance, publishing many portraits of women. 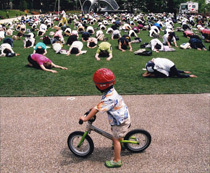 He has also worked regularly for advertising, magazines and publishing companies.